On Tuesday, I went down to Apple again. I got a t-shirt that says, "I visited the Apple campus, and that's all I'm allowed to say." Lori and Laura got together; they went shopping and indulged in tea at the Crown and Crumpet Tea Room. I hope that Lori can chronicle her tea, because our notes say "all exemplary" with out much detail. We joined Laura and Jeff again for dinner. 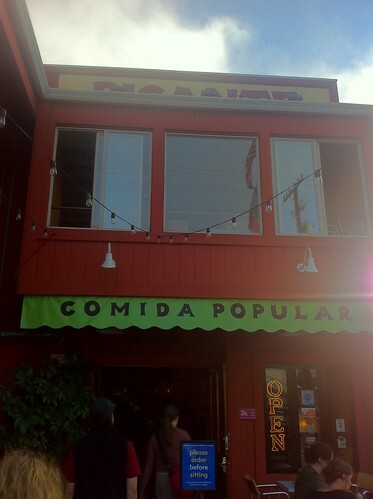 Laura suggested Picante, a Mexican restaurant with a focus on fresh, local food. 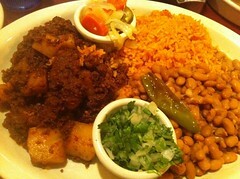 I had the chorizo y papas and a manchamanteles taco. I'd never heard of manchamanteles before; the menu described it as "'tablecloth stainer' chicken in a red mole". It surprised me by being fairly bland and flavorless. 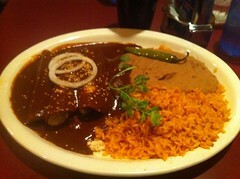 Lori chose flavorful enchiladas with mole sauce, and had her first sample of jamaica agua fresca. ("Jamaica" in this context means hibiscus flowers.) 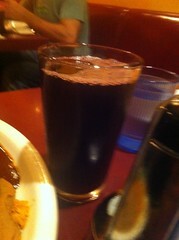 The jamaica was essentially an iced tea made from hibiscus flowers, reasonably tasty but not a rare delight.